WASHINGTON (PAI) – In the latest example of the U.S. Supreme Court’s responsiveness to the radical right agenda, the justices will hear a case from Chicago about whether union-represented home health care workers, whose employer is the state, but who object to unions, must pay for the union’s services. The case, which has been wending its way through lower courts for three years, involves several home health care workers who say they detest the Service Employees’ representation of the workers, as a group, with the state of Illinois as their employer. They said union representation violates their 1st amendment and 14th amendment rights to free speech and association. But while Pamela Harris and several other workers are listed on the case, the so-called National Right to Work Legal Defense Fund is funding it. And that radical right crowd hired a right ring attorney who argued before the justices last year that Democratic President Barack Obama’s health care law is unconstitutional. The case is important because in recent years, several unions, notably SEIU and AFSCME, have unionized the home health care workers in various states – who had been “independent contractors” – by making the states their co-employers along with the individual families the workers serve. The states, as the co-employers, negotiate wage scales, working conditions and benefits with the unions. Before, without an official “employer,” the home health care workers had nobody to negotiate with, so unions could not organize them. The unions added tens of thousands of such state home health care workers through legislation letting the states become their “employers.” The latest such win, for AFSCME, was in Vermont. If the justices reverse lower court rulings for the states and SEIU, the workers would not have to pay the unions a penny for representing them. The justices decided on Oct. 1 they would take the case, Harris vs. Quinn, over the objections of Illinois Gov. 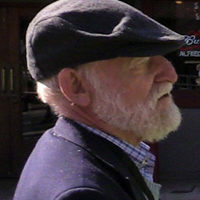 Pat Quinn – the defendant – SEIU and even the U.S. Justice Department. A live hearing, or oral argument, will be next year. 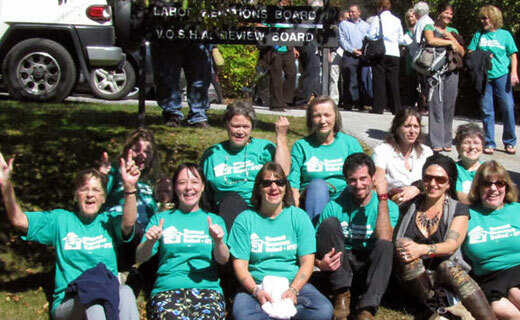 Photo: Members of AFSCME Vermont Homecare United celebrate outside the Vermont Labor Relations Board.